Program #BARA010. Recorded in Boulder, CO on July 28, 1984. 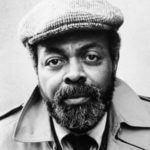 Amiri Baraka reads some of his best poems including: Wise One, Reflections, The Premium, Class Struggle in Music, Black Music, Wailers, Sounding and How to Beat Reagan. The event concludes with Allen Ginsberg introducing writer and poet Simon Ortiz of the Acoma Pueblo. Mr. Ortiz leads a Native American chant. Recorded at Naropa Institute. Amiri Baraka was a cultural icon and an iconoclast. He rose to fame in the 1960s as LeRoi Jones. His 1964 off-Broadway play, Dutchman created a sensation. Later he became Amiri Baraka and was a central figure in the Black Arts movement. He was an award-winning playwright and poet and recipient of the PEN/Faulkner Award and the American Book Award for Lifetime Achievement. He was a member of the American Academy of Arts and Letters. He was the author of many books including the classic Blues People. He was brilliant as a homeless sage in the movie Bulworth. His politics were uncompromisingly radical. Through his work he explored the parameters of African-American culture, history, memory, racism, class struggle and political power relationships. As an orator he had a distinct and urgent style. He had a special affinity for jazz and such titans as John Coltrane, Max Roach, and Thelonious Monk. He once said of himself, I’m a revolutionary optimist. I believe that the good guys—the people—are going to win.” He died in 2014. Thousands turned out in his hometown of Newark to honor him.